Sharing what we know with the community is important to us. GVEC welcomes the opportunity to visit your school, library and community and civic events with educational presentations that are memorable and tailored to meet your needs. Educational presentations for students are based on TEKS curriculum requirements and include resource materials for teachers. Topics range from electrical safety to the science of electricity. We also offer general interest presentations on efficiency, solar alternatives and other related topics for civic and community groups. These presentations are always changing, so call us at 800.223.4832 or email info@gvec.org for a presentation that meets your needs and interests. Who doesn’t love GVEC’s life-size safety mascot? 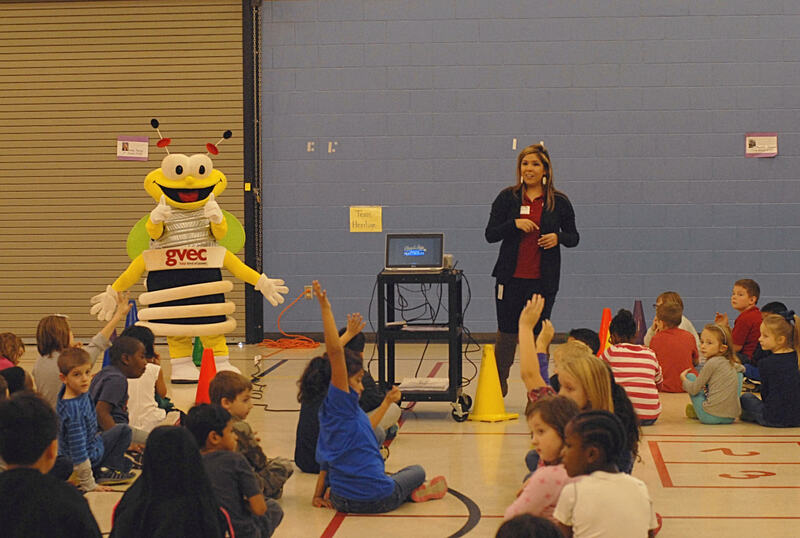 Each year GVEC presents the Louie the Lightning Bug electrical safety program in second grade classrooms within our service area. The program teaches students how to be safe around electricity and includes a video starring Louie and his friends. The presentation also includes a coloring contest featuring Louie and his safety tips. Teachers select one boy and one girl winner to receive a prize from GVEC at a later visit. The Louie program has proven to be a successful tool for teaching students about safety while having fun. All second graders are eligible to enter the coloring contest; however the children and grandchildren of GVEC directors and employees are not eligible for prizes. For information, call 800.223.4832, email info@gvec.org, or fill out the request form below. This live demonstration uses real electrical voltage to produce arcs and popping and buzzing noises, so the audience not only sees the dangers, but hears what it sounds like as well. To make this time valuable for teachers, too, we weave in elements from the Texas Education Agency (TEA) state test and the Texas Essential Knowledge and Skills test (TEKS), and provide resource materials. For information, call 800.223.4832, email info@gvec.org, or fill out the request form below. The Van de Graaff presentation is truly a hair-raising experience. It’s a fun way to introduce the concept of electrical conductors and insulators and explore the basic properties of protons and electrons. What makes this learning experience especially memorable is that students are able to experience the power of static electricity. Once they touch the miniature generator, they’re able to see their hair stand on end with the power of static electricity. This presentation includes elements from the Texas Education Agency (TEA) state test and the Texas Essential Knowledge and Skills test (TEKS) to make this time valuable for teachers as well. We also provide teachers with resources materials, such as vocabulary sheets. For information, call 800.223.4832, email info@gvec.org, or fill out the request form below. If you need a speaker for organization, give us a call. From scout meetings to chamber and civic groups, we can tailor a presentation to meet your needs and interests. Just a few of our more popular ones include energy efficiency, GVEC.net and Fiber power, POWER UP, and GVEC Services including TextPower, SmartHub and GVEC Energy Efficiency Rebates. For information, call 800.223.4832, email info@gvec.org, or fill out the request form below.